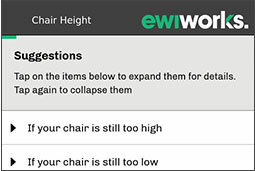 EWI Work’s remote ergonomic assessment app (ErgoConnect) gathers general information about you, including demographic information, general body discomfort information, information regarding your work tasks and/or workstation set up. The means for gathering this information is in the form of a questionnaire and photo images. This information is only sent to the email address you select to send the results to and is not stored anywhere else. In the case it is sent to EWI Works, we will retain this information in a safe and secure manner. By using the app you acknowledge and agree that the collected personal information will be used in order to conduct/provide an ergonomic assessment for you and/or your organization; and in order to assist you and/or your organization with the assessment/implementation of recommendations. 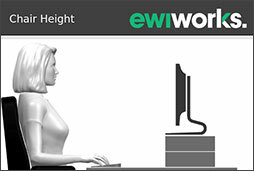 Your general information will not be distributed by EWI Works outside of the organization. Your email address will only be used to contact you regarding the assessment.